Order in 2 Hours 54 minutes 56 seconds for dispatch today! The Extreme Salopettes are the ideal all day leg-wear for the active user in extremely hostile conditions, at high altitude, in deep winter, or in polar regions. 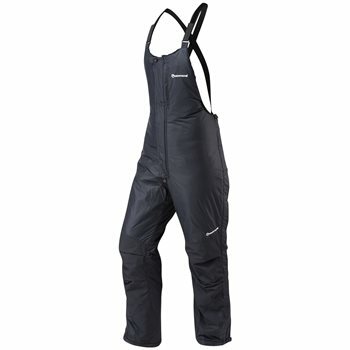 Using the original soft-shell concept of DRYACTIV® 3000 Pile and PERTEX® 6, this bib and braces trouser is a base-layer, mid-layer and outer-layer in a single garment. With full-length side zips, good storage options, reinforcement patches and cinchable ankles, the Extreme Salopettes are the most highly featured and versatile of all winter mountain Salopettes.